les mauvaises herbes du mal. . . Sigh. . .French translation exam is done. Ran out of time before I finished. I've been practicing on a book by Etienne Gilson, L'etre et l'essence. Very straightforward, logical Thomistic stylist. The exam was a passage from Descartes letters! Not a straightforward, logical Thomistic stylist. I should have been a little more eclectic. So, here's to trying again in October. . .
at the Chapel of SS. Domenico e Sisto, Angelicum in Rome. A cousin sent this to me. . .no idea where she got it. In the beginning, which occurred near the start, there was nothing but God, darkness, and some gas. The Bible says, 'The Lord thy God is one, but I think He must be a lot older than that. Anyway, God said, 'Give me a light!' and someone did. Then God made the world. He split the Adam and made Eve. Adam and Eve were naked, but they weren't embarrassed because mirrors hadn't been invented yet. Adam and Eve disobeyed God by eating one bad apple, so they were driven from the Garden of Eden. Not sure what they were driven in though, because they didn't have cars. Adam and Eve had a son, Cain, who hated his brother as long as he was Abel. Pretty soon all of the early people died off, except for Methuselah, who lived to be like a million or something. God fed the Israel Lights every day with manicotti. Then he gave them His Top Ten Commandments. These include: don't lie, cheat, smoke, dance, or covet your neighbour's stuff. Oh, yeah, I just thought of one more: Humour thy father and thy mother. After Solomon there were a bunch of major league prophets. One of these was Jonah, who was swallowed by a big whale and then barfed up on the shore. There were also some minor league prophets, but I guess we don't have to worry about them. During His life, Jesus had many arguments with sinners like the Pharisees and the Democrats. The worst one was Judas Asparagus. Judas was so evil that they named a terrible vegetable after him. Jesus was a great man. He healed many leopards and even preached to some Germans on the Mount. But the Democrats and all those guys put Jesus on trial before Pontius the Pilot. Pilot didn't stick up for Jesus. He just washed his hands instead. Anyways, Jesus died for our sins, then came back to life again. He went up to Heaven but will be back at the end of the Aluminium. His return is foretold in the book of Revolution. We are in the very best of hands: AG Holder hasn't even read the AZ anti-illegal immigrant law he has threatened to challenge in court. One of my fav games in grad school: while attending university functions, I always ended up in chats with faculty/students from one or both US coasts or from Europe. . .we would discuss literature, politics, philosophy, etc. I loved to watch the incredulity on their faces when I told them that I was born and raised in rural Mississippi and attended public schools. For them, this was like learning first-hand that monkeys can not only talk but read and write as well! On the adverse consequences of training college students to hear racism, classism, and sexism in the most innocuous language. The central hermeneutical problem with "racial awareness" dogma is that the perceptions of the hearer are given priority over the intent of the speaker. IOW, it doesn't matter what you meant or what you actually said. . .the only thing that matters is "what I heard you say." SCOTUS nominee Elena Kagan calls Judge Richard Posner (7th Circuit Court of Appeals), “the most important legal thinker of our time." If this is so, then why doesn't she decline B.O. 's nomination and argue that Posner be given a seat on the S.C. Answer: Posner is considered a conservative legal rock star. Venezuela is quickly becoming another example of the inevitable failure of socialism. Insta-buttons for all your fav movie/video game/prank sound effects. The Poet and the Thug-rose: a lesson on perspective. Useful phrases for those times when the temptation to be a smart-a$$ just can't be resisted. A few updates. . . Finally! There is some positive movement on the Summer Plans front. Not all is doom and gloom. Deo gratis. French translation exam tomorrow afternoon. . .please, get those prayers heading heavenward. I'm gonna need them. If I pass the exam, I will move on to the oral/written exams and the defense of the thesis. Thanks for the activity on the Wish List. I will have a nice stack of new material to keep me and the squirrels busy while visiting the parentals. I'm still drinking the Apple Cider Vinegar solution. It has allowed me to skip the evening meal w/o getting a low blood sugar headache. I've not really been able to test out its anti-sweating effects. The weather here has been cool and cloudy. Nice side effect of skipping dinner: I'm sleeping much, much better. Podcasting News: since 4/19 there have been 510 homily downloads. Mille grazie. The White House reports that a group of enraged Lutheran extremists in Sweden attacked the cartoonist who drew a picture of Martin Luther with a dog's body. B.O. called on Christians to denounce this violence and end the persecution of those who disagree with them. In other Christian-terrorist news, a member of the MSA (Methodist Student Association) at UCSD openly calls for a Holy Crusade against the Muslim minority populations of the Middle East. Here's one surefire way to make sure professors don't run their classes into overtime: concealed handguns! Apparently, this solution is spreading. 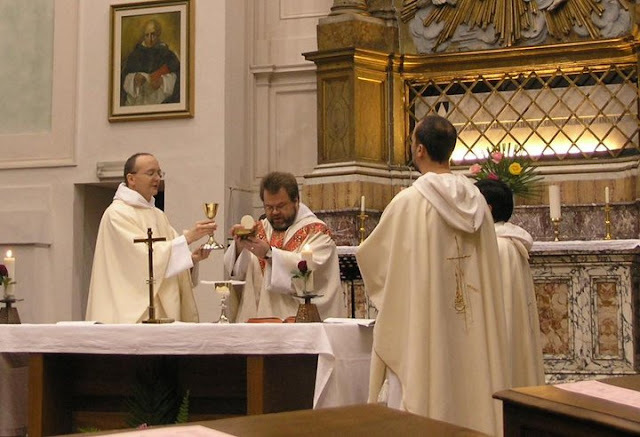 Take one look at this pic and you will see where the Catholic Left wants to take the Church of Rome: down the suicidal path of the Episcopal Church. The unanswered question remains: if this is where dissenting Catholics want to go, why don't they just go? In Ontario, teachers are becoming Catholic in order to get teaching jobs with Catholic schools. The astonishing piece of info in this notice? The province's Human Right Code graciously deigns to allow Catholic schools to discriminate against non-Catholic when hiring their teachers. Thank you so much, Ontario, for tolerating our irrational prejudices! Just fine by us: "A new Pew Research Center Poll finds fully 73% of the country thinks police requesting immigration status documents is fine, while 67% think detaining someone for a status check is OK." Keep in mind: the new AZ anti-illegal immigration law empowers state police to check a person's immigration status only in the context of otherwise lawful police activity; in other words, a traffic stop, a shoplifting arrest, drug bust, etc. Police are not empowered to wander around randomly asking people for papers. B.O. 's nominee to head the Centers for Medicaid and Medicare Services, Donald Berwick: “Any health care funding plan that is just equitable civilized and humane must, must redistribute wealth from the richer among us to the poorer and the less fortunate. Excellent health care is by definition redistributional.” Surprise! Are you a small-bladdered movie buff? Here's a site just for you! My kind of organic chemistry! A whole bunch of funny pics. . . The good folks at Liguori Publications have recently posted a link to a few sample pages of Treasures Holy and Mystical, including the table of contents! What is the truth that Jesus believes the disciples cannot bear? What is the “much more” he has to tell them? The intrigue of knowing that there is a secret to tell but not knowing what that secret is might tempt us into wild speculation. Is there a body of occult Christian knowledge to be learned? Arcane symbols, rituals, books of secreted lore? We might even go so far as to guess that the gospel writers left out the Good Stuff so that the herd of gullible believers wouldn't contaminate the True Teachings of Christ. Do all those non-canonical gospels—the Gospel of Peter, the Gospel of Thomas, the Gospel of Mary—do they reveal the “much more” that Jesus thought the disciples couldn't bear? No, they don't. There is no secret knowledge, no truths hidden in coded messages, no decoder rings, or elaborate handshakes. There is the truth that Christ himself reveals. No more, no less. Christ himself is the Truth. Following after him, getting behind the Truth, is at once freeing and binding; Christ cuts our bonds, binding us to his truth. Jesus tells his disciples that there is much more he needs to tell them, but what he has left unsaid is too much for them to bear. At that moment the disciples must have been deeply, thoroughly scared to death. Consider what he has already told them. He has told them that he will be tortured and that he will die—horribly—and they will be left to carry on his preaching. He has told them that because they will go on to preach his good news that they too will be tortured and that they will die, also, horribly. If Jesus believes that his students can bear up under this bit of dark prophecy, what could he possibly have left to tell them that is too much for them to bear?! We can imagine that their worst fears, their most dread nightmares are rising to the surface. . . They will have to wait to hear what waits for them. Just a little while more, wait. Jesus tells them, “. . .when he comes, the Spirit of truth, he will guide you to all truth.” All that he has taught them to this point has been true. But he has not taught them all the truth. The truth he has not yet to teach them is not teachable, not transferable in a lesson or a parable; what he has left over is not sayable in words or done ritual, not unveiled in gesture or exposed by display. The whole truth, all the truths of Christ, must be lived and lived in the coming Spirit, revealed to the grief-burdened men and women of the Upper Room by the ferocious bonfire of the Holy Spirit's passing. In modern terms, we would say that the “much more” Christ has to tell us is intelligible only as direct experience; “much more” must be lived to be known. But “experience” is a sterile word; it hardly does justice to what it means to be freed by Christ and bound to him forever. When the Spirit comes to speak to us all that he has heard from Christ, to declare all the things that are to come, to glorify his holy name and unstick our tongues to praise that Name, then we will know the “much more” that Jesus would not speak, all the truths that he knew our unprepared souls could not bear. How will we know? Because when the moment of revelation comes, we will not being reading about it, or hearing it described, or watching it unfold. We will be on fire, in the center of the conflagration, ourselves the fuel and air that feeds the flames of truth's unveiling. We won't have to ask, “Is this the 'much more' Jesus didn't tell us?” Why? Because we will be Much More, the living sparks who set the bonfires that burn through this world's darkness; the lights of Christ, bound to his light and freed to shine. On SCOTUS nominee, Elena Kagan: Being nice to your ideological enemies is not a sign that you think they are right. Does Kagan believe that the Constitution can be read to support SSM? Maybe. 64 high speed chases in AZ county. . .not one of the perps was a U.S. citizen. John Allen outlines the significance (and possible consequences) of Cardinal Pell being appointed to the head the Congregation of Bishops. Following the electoral chaos in the U.K. makes me very happy that our Founding Fathers chucked the parliamentary system in favor of something more republican! On the factually-challenged MSNBC. . .Chris Matthews blames the right-wing gov'ts of Greece, Spain, and Portugal for financial collapse. FACT: all three countries are currently governed by socialist parties. The Welfare State Death Spiral. . .is Greece a preview for the U.S.? On Obama Messiahism: "If twentieth-century history teaches us anything, it’s that political religions spell trouble." The Devil is always trying to seduce us with movements/ideas/causes that mimic the Church. . .anything to draw us away from Christ! Homer Simpson, call your cardiologist! It's processed ham infused with more processed ham. 10 Bizarre Psychological Disorders. . .these are bizarre; however, nothing beats Borderline Personality Disorder when it comes to just plain scary. . .and untreatable. Or, you could suffer from Dress Up Like a Doctor Kill a Deer and Drive Around in a Stolen Ambulance Disorder. Have the disciples been listening? Have they truly heard what Jesus is trying to teach them about who and what they are to become? On many occasions in the three years they have spent with Jesus, the disciples have misunderstood him, ignored him, failed to follow him, and now, as he stands on the verge of leaving them behind, they exhibit a curious lack of curiosity. Jesus says to them, “Now I am going to the one who sent me, and not one of you asks me, ‘Where are you going? '” Do they fail to ask because they do not care? Or, because they already know and don't want their worst fears confirmed? Jesus answers the question for us, “. . .because I told you [that I am leaving], grief has filled your hearts.” His friends know that he is leaving them behind, moving on to Jerusalem and a gruesome death. Though their grief is only natural, it cannot stand against the coming of the Advocate, the Holy Spirit, who convicts the world of sin and convinces the worldliest heart that not even death can triumph over the promise of eternal life through Christ. Two thousand years later, the question still matters. Baptized, confirmed in the Spirit, nourished at the altar, where are you going? Jesus is gone and the Advocate has come. Where are you going? To Jerusalem and your cross? Of course. But there are many hours and many miles between now and then, here and there. If the Spirit has convicted us of our sin and convinced us of the truth, what do we do in the meantime, all those miles in between? We do what Jesus did. We do what the disciples did once the Spirit seized their grieving hearts. Proclaim the truth. Heal the sick. Feed the hungry. Forgive, love, show mercy. Bring peace to worry. Bear good fruit and give it away. Live in joy. Die for your friends. Each time, a step behind our Lord. Each step, a moment longer with him. Where are we going? Wherever the Spirit sends us. When are we leaving? If we've been listening, we are already well on our way. Clear? Speaking too fast? Too slow? Ease of downloading? Problems of any sort? The echo is unavoidable since the chapel has a 30ft ceiling. . .I turn the microphone away from the lectern b/c I figure my big mouth hardly needs amplification. 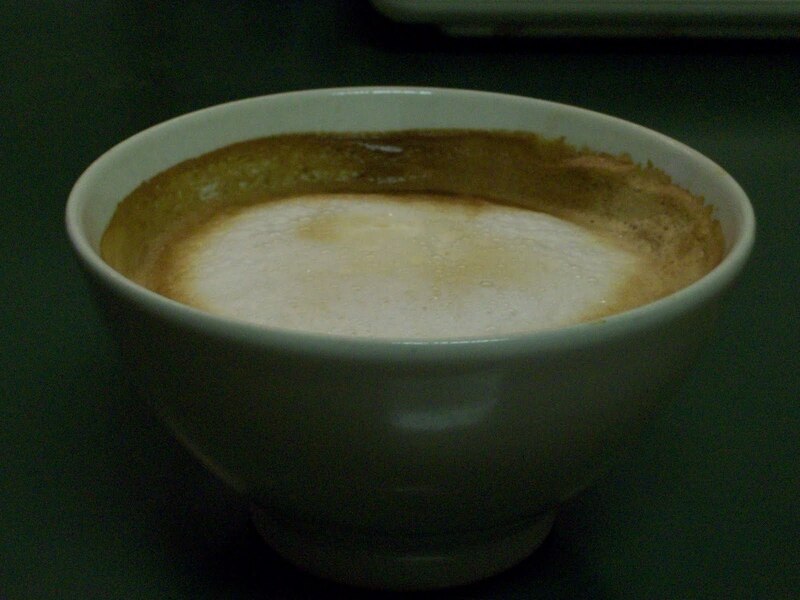 <---Yes, the actual Bowl of Coffee Bowl Browsing! Presumably, one of the reasons people want to immigrate to the U.S. is to enjoy our tradition of natural rights, including the right of free expression. But, as we all know, when natural rights conflict with The P.C. Cause of the Moment, rights take a hike. On the cheap gracelessness of the New Atheists. . .David Hart puts the smackdown on this generation's Barbie Unbelievers: "The principal source of my melancholy, however, is my firm conviction that today’s most obstreperous infidels lack the courage, moral intelligence, and thoughtfulness of their forefathers in faithlessness." Weekly Standard: "Why does the Obama administration find it so hard to utter the words ‘terrorism’ and ‘jihad’ and ‘Islamic extremism’?" Because, like most postmodern relativists/nominalists, B.O. believes that words magically create reality. . .
Polling opinion on the Supreme Court: Americans don't want a more liberal Court. NB. the poll doesn't ask respondents to define "liberal," so it is not entirely clear what this info means. B.O. 's Attorney General says that the new AZ anti-illegal immigrant law is not motivated by racist ideology. A poem by Pablo Neruda: "I Do Not Love You"
The Game of Kings. . .with booze! Goat hooves, a gold revolver, and footwear. . .High Caliber Fashion!